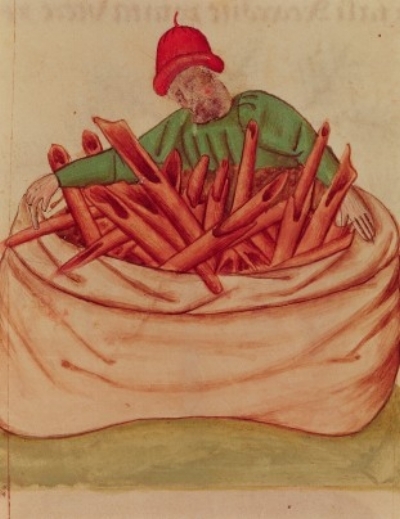 This image above is from the Tractates de Herbis of the 15th century. Think of it as the Rosetta Stone for medicinal plants. Medical knowledge and treatments were used and known throughout all the different ancient worlds and as such all known by different names. This manuscript would show different plants and what they did. This was revolutionary for medicine as well as botanical illustrations as a systematic resource and reference tool. Cinnamon sticks are the inner bark of trees from the Cinnamomum trees native to India, Sri Lanka, Bangladesh, and Myanmar. It’s distinctive smell and flavour comes from the cinnamaldehyde essential oil in the bark. It was known to the ancients and its value for cooking, health and ritual ensured that it was reserved only for royals, the wealthy elite and even the gods who it was burned as an offering to. Its origin was kept secret which increased its monetary value. It wasn’t until the 19thc that cinammon became a common ingredient after Portuguese, then Dutch, then British colonial merchant traders seized control of the spice trade routes. Cinnamon can be divided into two major types…Ceylon from in Sri Lanka and Cassia from Indonesia. Ceylon is the more mellow and sweeter of the two and in stick form it is curled up in thiner sheets. Cassia is the more intense in smell and flavour yet cheaper type of cinnamon. Most importantly it’s Ceylon that has the health benefits associated with cinnamon not Cassia. Cinnamon contains lots of manganese, some calcium and fiber. The benefits of cinnamon include anti-inflammatory effects, antiviral, antibacterial and anti-fungal properties. In stick form it will last roughly a year and as a powder it’s potency will go after a few months.